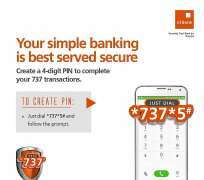 Identification Number (PIN) for completing transactions on the 737 banking platform. This means that customers can now create a 4 – digit PIN and use this PIN to authenticate their transactions. details, so you should never share it with anyone or keep it where a third party might have access to it. If you ever feel that your PIN has been compromised, repeat the Create PIN process by dialing *737*5# immediately and choose a different set of 4 digits to authenticate your 737 transactions.